Two games into the 2013 campaign, head coach John Daly’s squad has faced three overtime periods — yet the Tribe has only one point to show for its efforts. After dropping the first match of the year to Georgetown 2-1 in overtime, the College (0-1-1) returned to the Martin Family Stadium Sunday night to face George Mason in the home opener. One hundred and ten minutes of soccer later, the Tribe settled for the tie, still searching for the season’s first win. Daly, who leads the College in all-time wins, saw his squad take a 1-0 lead into halftime on the road against No. 18 Georgetown. Junior forward Emory Camper deflected senior defender Ali Heck’s cross minutes before the halftime whistle. The lead, however, would not hold. Hoya goals in the 72nd and 96th minutes, both tallied by forward Kaitlin Brenn, spoiled the Tribe’s season opener. Georgetown managed 11 shots to the College’s two. Facing George Mason, the Tribe offense needed to respond after its underwhelming outing days before. However, it was the Patriots who struck first in the 35th minute, as forward Casey Vornadore found space 20 yards from the College’s goal and fired past sophomore keeper Caroline Casey for the early lead. After more aggressive play from the College’s attackers, the breakthrough came in the 65th minute. 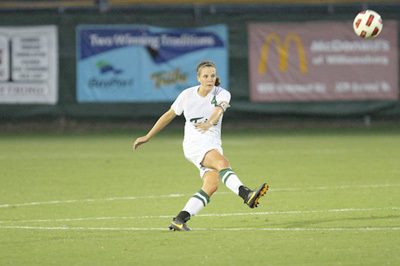 Senior forward Audrey Barry whipped a cross in from the left flank, causing George Mason’s keeper to leave her line. The resulting collision with Camper left room for sophomore forward Samantha Cordum to tap in the loose ball. Injured on the play, the Patriot’s replaced goalkeeper Lyndse Hokanson with back up Briana Kottler. Looking to test the new keeper, the Tribe dominated the remainder of regulation. Like the Georgetown game, this contest headed to extra time. While George Mason enjoyed the majority of possession in the first overtime, the College took control in the second. Camper came closest to scoring, barely missing the far post in an opportunity late in the period. The game ended in a tie, leaving the Tribe still searching for its first win. The College finishes its two-game homestead tonight, facing High Point at 8 p.m. Daly and company should expect solid competition from the Panthers, who posted a 10-6-6 (8-1-2 Big South) last season. Follow @FlatHatsports for live coverage of the game, including score updates, analysis and insights. Senior staff writer Chris Weber '15 is an English major from Spotsylvania, Va. He was previously Sports Editor.